You can see one in my Etsy shop, thank you. Ugh I love steampunk, wish I could make my own. That is amazing! I just love it, and that you only used such limited material is so cool. What type paint did you use on it, and what colors? 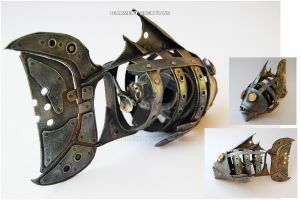 I used this mask, cardboard and plastic parts, and several metallic layers of different shades. Your painting skills are enviable! This is simply marvelous! A very creative piece indeed! Thank you very much! happy to be a part of this group. always my pleasure and thanks for the accept I'm really very glad you think so. You are an amazing artist! I love this! Thank you very much! I'm glad you like my works. I think to do other masks as this one, thank you for visiting my works. If I may ask, how exactly did you get the cardboard to look like metal? Thanks! I'm glad you looked at the details.